Spectacular Sunsets over Nicoya Peninsula & Space to Contemplate. 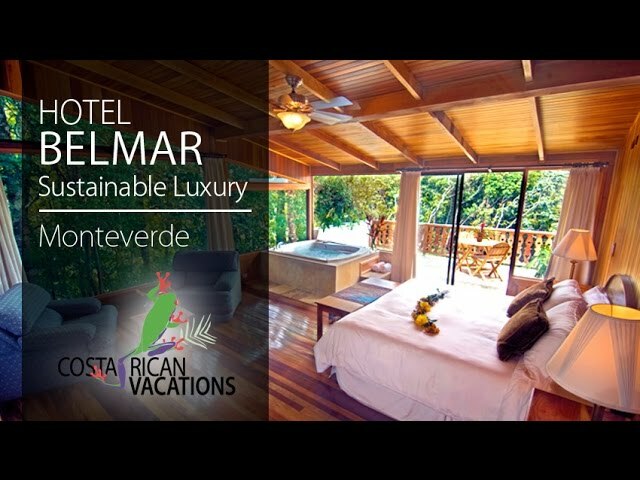 This family owned, boutique eco-hotel is one of the pioneers of tourism in Monteverde, offering its guests nine acres of pristine cloud forest with nature trails along a stream, a waterfall lookout, and a tranquil pond as a serene spot for contemplation. The hotel offers nine different, recently renovated chalets—an Austrian Alps-inspired theme, with floor to ceiling windows—some of them inches away from the tree canopy, as well as spacious bathrooms with bathtubs and ample balconies. Belmar and Canopy rooms have open-concept bathrooms with a two-person Jacuzzi overlooking the canopy—perfect for couples. Sunset and Sunrise rooms offer 270-degree views of the mountains of the Monteverde cloud forest and the Nicoya Peninsula—just perfect for birdwatching experiences right from the spacious terrace. All rooms come with the following amenities: one king-size bed or two queen-size beds with orthopedic mattresses and high-quality cotton linens, locally crafted and hand carved wooden furniture, hair dryer, safety deposit box, telephone for free local calls and available international calls, and complimentary WiFi. You’ll feel pampered with the cotton slippers, bathrobes, mini-bar including organic, locally made snacks, and handmade, organic toiletries. Some rooms feature an open bathroom concept, so be sure to specify if that something that interests you (or doesn’t!). Landscaped gardens surround the chalets, boasting lush native plants, a vegetable and herb garden, and a beautiful swan lake with a sundeck. Aside from the private trail in the hotel’s preserve, the property is located near the entrance of other trails. The most notable of these is Cerro Amigos, the highest mountain in the entire region. The hotel is committed to environmental protection, having become certified through the Costa Rican Tourism Board with a Level 5 (highest available) CST (Certificate for Sustainable Tourism).